Because manufacturing is such a broad field, there are many manufacturing job titles which encompass a variety of job descriptions. Manufacturing involves creating new products, either from raw materials or from pre-made components. Typical jobs might involve working on the mechanical, physical, or chemical transformation of materials to create these new products. Manufacturing plants and factories need more than just people who work on a production line, an efficient operation requires employees in numerous roles, including management and quality assurance. Due to technological advances reducing the need for workers, this is one of the sectors where the Bureau of Labor Statistics expects employment to decline slightly. The median annual wage for production occupations was $33,990 in May 2017, which was lower than the median annual wage for all occupations: $37,690. Some positions are higher paying union jobs – usually skilled positions – while other unskilled positions typically pay lower wages. Educational requirements vary significantly based on the job. Some positions may provide on-the-job training, while others may require a college degree. Although technology may contribute to the decline in some positions, education or certification in a technical area improves your chances of job security. Since the industry is evolving, it’s important to keep your technical skills current. Workers who keep manufacturing trends in mind while orchestrating their career path will have a more successful experience in this field. Read below for a list of some of the most common manufacturing job titles. 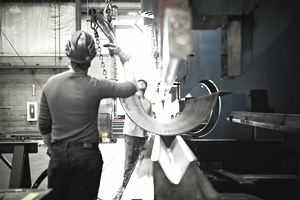 Use this list of job titles when searching for a job in manufacturing. You might also use this list to encourage your employer to change the title of your position to fit your responsibilities. For more information about each job title, check out the Bureau of Labor Statistics’ Occupational Outlook Handbook. Assemblers and fabricators put together pieces of products, and also assemble finished products. They use their hands, as well as tools and machines. Most assemblers and fabricators work in manufacturing plants. Most of these positions require a high school diploma, but many employees also get on-the-job training. Welders, solderers, cutters, and brazers use equipment to cut and/or join metal parts. Most of these positions require some technical education, through high school courses, vocational schools, community colleges, or similar programs. They also receive on-the-job training. These positions require an eye for detail, the ability to operate equipment, and the ability to read blueprints and diagrams. Machinists and tool and die makers set up, maintain, and operate computer and mechanically-operated machines that are used to create parts for the manufacturing process. These positions require training, either in apprenticeship programs, vocational schools, or community or technical colleges. These employees also receive lots of on-the-job training. Production managers oversee the day-to-day operations at manufacturing plants. They ensure that production stays on schedule, they hire and manage workers, and they fix any production problems. Many production managers will have a bachelor’s degree, typically in business or industrial engineering. Quality control inspectors examine materials and products for any hazards, defects, or deviations. They generally work in manufacturing plants, inspecting products. Most quality control inspectors require a high school degree and receive on-the-job training. If they are required to use technical equipment and computer programs to inspect products, they might need a higher degree, such as an associate’s degree in quality control management.